This beautiful snow-capped volcano rises out of the Abraspungo Valley. According to Quichua mythology it means " man of snow and wind " and it was believed among the Indians that Carihuirazu was higher than Chimborazo and due to the struggle to win who was the bigger, Carihuirazo exploded thus forming the huge Caldera it has. It is just facing Chimborazo in the north and due to its height does an ideal acclimatization mountain for people want to climb Chimborazo. No previous experience is needed and the ascent itself is relatively easy but full mountaineering equipment is needed. The landscape is gorgeous and there is a good opportunity to see llamas and vicuñas as well as a lot of Indian shepherds. Vicuñas and llamas can be observed from very close. Great views to the huge front of Chimborazo which lies just in front of it. Snow capped volcano although not always. Moderate climb although suitable for beginners. 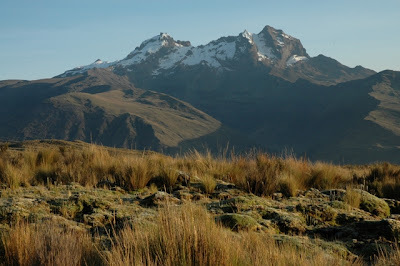 Duration: 2 days – can be combined with the Chimborazo trek. Accommodation in tents at 4200m. Estimated climbing hours: 5 - 6h. Ascent, 2 - 3h. Descent. Need of some technical equipment.